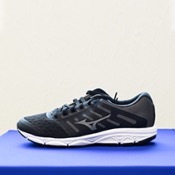 Discover Mizuno technology at a entry level price, with expert performance. This brand new design features a flexible midsole, that gives you incredible comfort and a fantastic fit and feel - for an unrivalled running experience. No you can go anywhere with the incredible Michelin rubber outsole - designed for multi directional traction and maximum adaptivity. The XtaRide, dynamic cushoning and parallel concave Wave allow the shoe to adapt to any surface and work in perfect harmony with the body. The new reinforced toe and heel cap give you increased protection. Your everyday go-to shoe has just has a serious upgrade. Anatomically engineered using our new Wave technology - this show is stable but dynamic, fast and fun to run with. The independent decoupled sole design gives more flexibility and smoother heel handling. - New heel wedge with more flexibility through decoupled areas. Created for athletes of all sizes. Anatomically engineered for your greatest performance yet, with Parallel Wave technology providing a cushioned and more responsive ride, allowing you to go faster and further.